The latest news and rumours from the Farm Model World including new items from Ertl and Universal Hobbies. 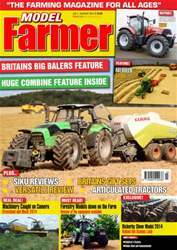 David Pullen analyses the latest and past NH Big Balers from Britains and Ertl. Nick Wigdahl reviews the latest Mercedes Model from weise toys. Nick Wigdahl explains what forestry models are available to the carpet farmer. Want to downsize? Nick Wigdahl talks us through the smaller scale equipment available. Nick Wigdahl looks at two new models from Siku in 1.32 scale. Peter Hardy explains some behind the scenes facts about this years model. Wil Zoetekouw and Kaat Zoetekouw walk us through some big Ford and New Holland tractors in their collection. 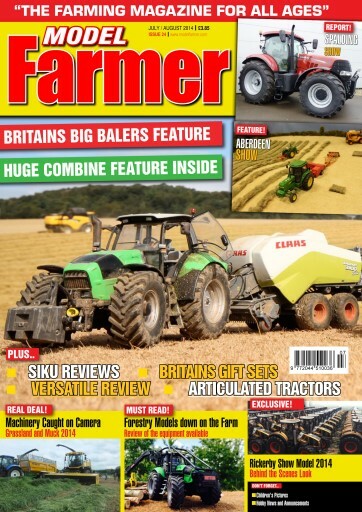 Mike Robinson spoke to Malcolm Pearce about his magnificent Claas Combine collection. Bill Cruickshank spoke to popular custom building duo, Mike and Avril Taylor. Bill Cruickshank continues his analysis of the Britains Gift sets from the 1980's and 90's. Bill Cruickshank reports back from the 2014 show held at a new venue this year. David Laley provides the pictures of this year's popular Spring Spalding Tractor Show. Nick Wigdahl sends us this report from Grassland and Muck 2014. We have a look at what you have been drawing us for this issue,.